Last week we talked about the birth of the MCU, from a sort-of behind the scenes point of view. Iron Man was certainly a whirlwind, a breath of fresh air in the world of comics-to-film, so a lot of its flaws (that third act especially) get overlooked to this day. Incredible Hulk was a misstep, but I think so many people forget it’s even part of the framework (and the ones that don’t usually defend it), that Iron Man 2 is usually pointed to as the bad apple of the bunch. And while I see its flaws wholly and completely, I think it’s unfairly pegged as the weak brick in Marvel’s nigh-impenetrable cinematic wall. One of its biggest flaws is actually one that was forced on it, and that’s the fact that it has to set up an entire cinematic universe. 2008 was Marvel deciding to build a pool in the back yard. Then when everyone showed up they just couldn’t help themselves and immediately decided that pool needed to be a water park. And fast. So we got Iron Man 2, which fully introduced us to Nick Fury, War Machine (Don Cheadle re-cast as James Rhodes no less) and Black Widow, teased Captain America (and Thor with the tag at the end of the film), and solidified its connection to The Incredible Hulk (which you have to look really hard to see, but there’s footage there). All to set up the aforementioned water park that would become The Avengers. It also still had to be and Iron Man film. That’s the stuff that really works for me. RDJ is undeniably fun, and I actually think Sam Rockwell and Mickey Rourke work as dual villains, not something you can say of most comic book films, but neither are indelible. The finale is huge and fun. I know it gets maligned as “oh look, he’s fighting himself,” but that’s literally every solo outing in the MCU. All of the heroes just fight evil versions of themselves. Every time. And that’s not an albatross that should be laid at around the neck of this film. 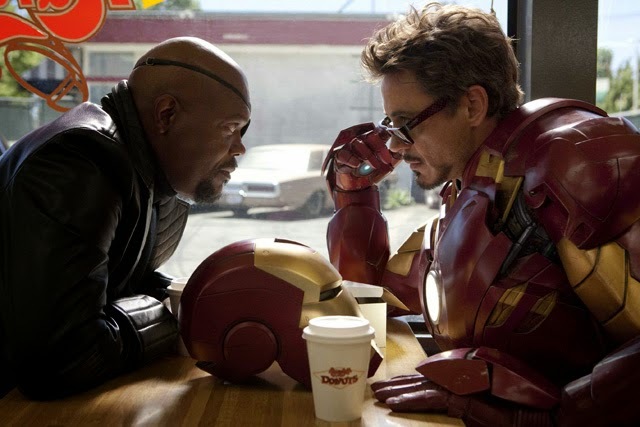 The proposed flaws of Iron Man 2 are the flaws of the MCU: Villains that are ultimately forgettable, clunky transitions, overstuffed plots, glowing McGuffins and (sometimes literal) deus ex machina. Those things are present in the first film, but it has such an excellent opening act it’s easy to forget that the last 30 minutes are pretty terrible. To further that point, the two films have almost the exact same run time, but the movie takes so many side streets and takes so long to develop that it becomes confusing and you wind up losing the plot. As I said, RDJ still works. Iron Man still works. The briefcase armor is worth the price of admission. In hindsight the courtroom scene is brilliant and plants seeds that wouldn’t come to fruition for years. Sam Rockwell is so much fun to watch it’s upsetting that he’s not made a reappearance in the MCU (outside of a one-off Blu-Ray extra). The biggest mistake of Iron Man 2 is the one people so rarely bring up; the absolute waste of the iconic “Demon in a Bottle” storyline from the comics. For the unaware, in the source material Tony Stark at one point was revealed to be an alcoholic. It played out over nine issues, had Tony Stark coming to terms with the fact the he’s more deeply flawed than he’d ever even think to admit to, and actually had him killing a man. It’s still heralded as one of the best Marvel stories of all time. Yet what we get is Tony drunkenly attacking Rhodey at a party he throws for himself. Then they eventually make nice and beat the bad guy. I’m not saying they had to delve deep into the psychology of addiction, but this was a chance to add much needed pathos to the character, and show that the MCU was capable of addressing more personal drama, not just global. Something the Russo Bros do in the first five minutes of Civil War. But we’ll get to that eventually. It was a missed opportunity, and one that may have been seized were it not for the fact that this movie HAD to set up the future of this universe. And it does. It’s an unfairly maligned film, but definitely not a perfect one. Revisit it, and try to enjoy the ride. I’ll leave you with this. The MCU now encompasses 18 films over a 10 year period. To put that into perspective there are 26 James Bond Films. And that’s over 56 years. But what makes it really remarkable is that for the first three years of the MCU, there were only three.